Morgue & mortuary body refrigerators are available in both custom and standard sizes for your convenience. Standard models hold 3 bodies. 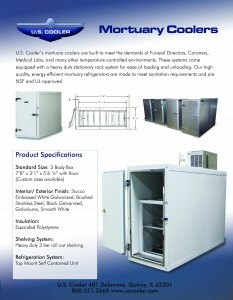 U.S. Cooler’s® mortuary refrigerators are built to meet the demands of Funeral Directors, Coroners, Medical Labs, and many other temperature controlled environments. These systems come equipped with a heavy duty stationary rack system for ease of loading and unloading. Our high quality, energy efficient mortuary refrigerators are made to meet sanitation requirements and are NSF and UL approved. Call 800.521.2665 to be connected to a dealer near you. Or fill out out this short online quote form for a Mortuary Body Box quote.